← Another foolish China-siding gesture in the works? In the first few paras of that piece I said about this prime ministerial initiative that it “was portrayed as Modi’s ‘out of the box’ solution for a problem that didn’t really exist. Plainly, he mistook the hard, extended, bargaining between the two sides as evidence of red tape, and cutting it as his unique achievement. But impatience is a liability in international relations and can cost the country plenty. Rather than pressuring French president Francois Hollande and the French aviation major, Dassault, which is in dire straits and was in no position to resist sustained Indian pressure to deliver the Rafale and the technologies involved in toto to India, Modi eased off, promising a munificent $5billion-$8 billion for 36 Rafales off the shelf minus any reference to the L1 (lowest cost) MMRCA tender offer, possibly a buy of another 30 of them, and no onerous technology transfer obligation. It is a turn that must have astonished Hollande and Dassault with its exceptional generosity….” and concluded, prophetically, that “Previous prime ministers have been victimised by bad advice, and paid the political price, for instance, Rajiv Gandhi with regard to the Bofors gun. 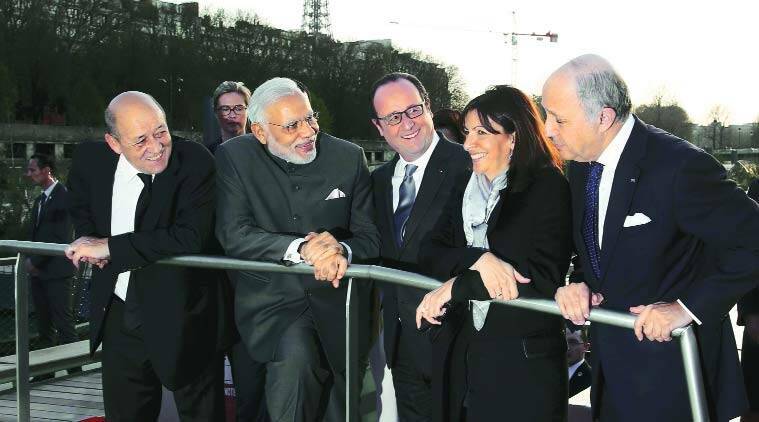 Modi will have to carry the can for this Rafale transaction—a boondoggle in the making. With the opposition parties …waking up to its potential to politically hamstring the BJP government and mar Modi’s prospects, anything can happen.” It also mentioned how the then defence minister Manohar Parrikar, favouring the speedy, economical, enlargement of the Su-30 fleet to meet the urgent requirements of IAF, was blindsided by the Modi decision. I repeatedly warned of a brewing political storm over Rafale in my writings and in the posts on this blog, ever since. Whether Modi manages to rides out this crisis is besides the point; that he cannot and will not escape the taint is certain. What is making it progressively difficult for the Modi dispensation to explain away a plainly flawed approach to military procurement by the PM taking the matter into his own hands and bypassing the established processes is that it has left a paper trail. The PM, in his capacity, can call in the Defence Secretary and instruct him to accelerate the acquisition process. But that’s a fry cry from his intervening forcefully at the price negotiation stage to, in effect, have his own representative — in this case the NSA, Ajit Doval, set up a separate negotiating track, which is absolutely barred by the settled “rules of business” of the GOI. The Prime Minister was bound to pay a political price. When bureaucrats in the decision loop are bypassed for any reason by the political poohbahs, they usually make sure to not end up becoming the fall guys. The remarkable thing is that it took so long — nearly four years — for the dam to burst, document drip at a a time. Considering that so many MoD officials were involved in the price negotiation committee over the years, all of them no doubt squirreled away copies of potentially “hot” files for just such an occasion as has now come to pass. Copies of the most sensitive documents are a safeguard, evidence to absolve themselves of any responsibility for things going wrong, as has happened re: the Rafale. Many of these dissenting officials, incidentally, were abruptly posted out of MoD not too long ago, which added to the general discontentment of the babus in the govt at-large and in the Defence Ministry in particular with Modi and his way of doing things. This to say that it was only a matter of time before these documents were “leaked” to the press. But why at this time? Babus, in their careers, develop very sensitive antennae. With Rahul Gandhi’s charge of corruption getting the traction it has — something the ruling BJP did not anticipate, the bureaucratic ill will towards Modi oiled the predisposition of those having the precious information about what really occurred to make the notings available to media persons. N. Ram, owner and sometime editor of the Leftist ‘The Hindu’ newspaper, and a longstanding “Cadillac communist” was the perfect vehicle for such leakage, because it segued in with the “mahagatbandhan” the numerous “socialist”-minded political parties are putting together to take on the BJP in the coming general elections. It is still a wonder why Modi was convinced to buy the 36 Rafales which, as I have argued, will be the classic ‘white elephants’ — good for nothing very much beyond Republic day flypasts. Surely, Doval couldn’t have advised him about the finer points of this fighter plane mainly because he knows so little about things military. There’s also no personal corruption involving Modi — that’s for certain. The prime minister is too upright a person for that. Modi may, however, have sought some benefits from the deal to accrue to the Ambanis and Reliance Defence possibly in return for funds for the BJP’s election campaign, which kind of exchange incidentally, is par for the course. Nothing new here, and the BJP did not originate such means of financing political parties either. This entry was posted in arms exports, asia-Pacific/Indo-Pacific, Asian geopolitics, Decision-making, Defence Industry, domestic politics, DRDO, Europe, Geopolitics, Great Power imperatives, guerilla warfare, India's strategic thinking and policy, Indian Air Force, Indian democracy, Indian ecobomic situation, Indian Politics, MEA/foreign policy, Military Acquisitions, Military/military advice, Nuclear Policy & Strategy, Nuclear Weapons, Russia, russian assistance, South Asia, Strategic Forces Command, Technology transfer, Weapons. Bookmark the permalink. , you state that Russia was a better alternative since you seem to suggest that? Have you served in the IAF? Are you implying that the current IAF chief is talking thru his hat and you know whats best for the country? Mostly arm chair warriors and strategists know very little and add to public opinion by not knowing the full facts; can you state that you know exactly what the Rafales jcapabilities are? Are you saying that you know MORE than the IAF chief who wants that aircraft? I have ALWAYS maintained that sometimes ( read mostly ) our babu’s and arm char warriors know little compared to reality! You arm chair warriors and strategists. AND babu’s in the MOD know whats best for our country so here you go- here are the guns, the equipment, that you promoted, and now YOU lead from the FRONT! By the way, ensure all of you civilians have a HUGE supply of baby nappies ( forget the ammunition) as you will need this even when you are approaching the front lines or running away from it. BTW, I am from 50th course NDA. So lets start hearing some balanced views rather than biased views and based on limited knowledge. You needn’t be a carpenter to know whether a piece of furniture is good. In any case, by your reckoning nobody but a fighter pilot can pronounce on aircraft and aircraft purchase, which’s near nonsense. Wish the world were as simple as you make out. Every major arms deal by a naturally consequential country has cascading international relations effects and can skew a country’s foreign relations every which way to the detriment of the national interest. Please bear in mind the themes and arguments I have been advocating and making for decades and found in my books have proved to be correct. I am confident I will be proved right not just on the Rafale but acquisition of MMRCA in general. You are, however, at liberty to pooh-pooh my expertise. I dont “pooh pooh” your writings but as an individual I do have my own views! You dont need to be a good carpenter to know good furniture- sure but does the same go for aircraft, Formula 1 cars etc. The ultimate feedback comes from test pilots and drivers; designers are just that and they dont fly planes! So by your writing and thoughts, you are implying that our IAF pilots know very little such as our Air Chief and you know much more? The soldier on the ground knows tge reality and certainly not you. Have you gone to the front and faced what our jawans face? Until you do that, you will NEVER know the ground reality and will live and write about a cuckoo world! Until you have faced the reality whether it is flying aircraft, fighting terrorists with RR, you will always remain an arm chair warrior; you are perfectly entitled to your views and thoughts but ground reality is very different. MOD civilians have weakened our armed forces so severly over the last 10+ years along with our previoys politicians who could’nt careless for the country. I shudder to think what will happen if China and Pak decide to flex their muscles! No, I do not know, cannot know, more than ACM Dhanoa or any other experienced pilot about the technical virtues and/or drawbacks of the Rafale or any other combat aircraft, and I have never claimed any such thing. However, knowledge about a machine is one thing, analysis about the adverse outcomes and effects of the purchase of any fighter plane, or capital military equipment, on the country’s finances, economy, and plans to push the indigenous defence industry, general cost-benefit considerations, strategy, on the regional and international correlation of forces, and on the country’s ties with major powers constitute policy material that civilians are better able to analyse for the same reasons that you cannot lift a tin tub while being inside it. While the machine is the military user’s exclusive domain, the rest of the stuff is not. Indeed, that’s the reason that most of the imaginative concepts of warfare, for instance, that advanced militaries have ended up adhering to usually are/have been the products of thinktanks and thinktankers. In the US, its air force tasked Bernard Brodie then at RAND (and later my professor at UCLA), to write the USAF’s strategy in nuclear war and, more recently, the air-land, sea-land, and hybrid notions of future war were all conceived by thinktanks. Officers on active roster in armed services are too preoccupied with day-to-day tactical concerns to think big, think long term, think economical and, generally, think strategic, and most retired militarymen can’t shake off their combat arm loyalties and prejudices to be dispassionate analysts. These are truths the Indian armed services are unwilling to acknowledge and, therefore, to act on. Can you pleae explain more what exactly is done in icf ? does it means that if one have access to this can actually develop high quality of TN weapons without actual testing needed? ICF is a lab-based process to iron out the perceived/potential kinks in weapons designs w/o actually testing. But it does not provide sufficient validation of the design which only underground explosive testing can do. Glad you absolved PM. Modi of being personally corrupt,he might have made a mistake but not for any personal gains. Regarding Rafale one feels the PM fell into the trap set by the IAF. Since the Kargil war, maybe even prior to it,the IAF has its heart set on acquiring French fighter planes. Initially they wanted the Mirage 2000, which production line the French were gladly willing to transfer to India. The offer of M2K production in India stood open since the contract for the initial M2K squadrons in flyaway condition was signed back in the early 1980s, but due to many factors,not least the MIG29 procurement,this offer was never taken up. In the intervening years the M2K made a name for itself in the IAF for its reliability and robust performance. The crowning glory for the M2K was its stellar performance during the Kargil war that helped the Indian forces boot out the Pak army from the lofty peaks. The precision ground attacks carried out with a lot of accuracy played a significant role in demoralizing the occupying forces,in fact the boom of the Bofors howitzer and the scream of the M2K engine were the two sounds the entrenched intruders came to dread. The M2K inflicted serious damage to Pakistan’s intruder posts, material and supply dumps after exhaustive sorties. The most spectacular attack was on the main administration and logistics hub of Monto Dhalo in the Batalik sector where two M2Ks levelled the entire area with 1000 pound general purpose bombs,upwards of 300 enemy casualties were caused in the precision attack in a matter of minutes. After Kargil the best thing for India would have been the production of 100 M2Ks in country but the MOD nixed the deal saying that the current model of the aircraft was different from the one procured in the 1980s so it cannot be termed a follow on order. Also the NDA govt did not want anymore untoward allegations in defense deals having just weathered the storm caused by the so called coffin scam,hence the decision was taken to have the MMRCA selection process and the rest is a long never-ending rigmarole. The French withdrew the M2K production offer in 2006 and entered the Rafale as the MMRCA contender.After an exhaustive process it was declared the L1 winner even though Rafale didn’t have a fully functional AESA radar at the time. The other worthies in the contest were not allowed even minor concessions by the IAF. Another lacuna was that In January 2012, when Rafale was declared the winner, its price was quoted between $60-65 million (Rs373-Rs400 crore). By January 2014 the frogs,as is their wont,had jacked up the cost to $120 million (Rs746 crore) citing extra items that had not been factored into the 2012 offer.The same modus operandi was used to jack up the Scorpene submarines cost albeit after production had started at MDL leading to time overruns and cost escalation of the subs.This time the MOD babus were maybe wiser and caught on to the French perfidy during the negotiations process though without much benefits for India.The second bidder, Eurofighter, had quoted $80-85 million (Rs497-Rs528 crore). The whole process had by now been mired in complex negotiations with no end in sight.This is the scenario that the NDA govt inherited from the UPA in may 2014.In the first briefing of the new RM the IAF cited “falling squadron strength”and the critical necessity of concluding the MMRCA deal to ameliorate the situation. All through 2014 and 2015,till PM Modi announced the procurement of 36 Rafale jets in flyaway condition citing “critical operational necessity”the IAF kept up the rant of depleting squadron strength and how India would suffer in case of atwo front war.This was done through sound bytes to the media.One can well imagine the kind of pressure they mounted on the RM and PM in closed door meetings . Another sound byte emanating periodically was that the SU30MKI,which the RM preferred,was a heavy aircraft and cannot be a replacement for the medium multirole Rafale. Given this background of a stalled MMRCA deal and having panned the erstwhile UPA for being lackadaisical about the needs of the armed forces during the election campaign,the PM probably thought he would cut through the bureaucratic red tape and do right for the country plus the IAF and also bolster his decisive leader image in the bargain.Little did he know that he’d been pushed into digging a hole for himself. “Glad you absolved PM. Modi of being personally corrupt”. Doesn’t make a difference to me if someone is personally corrupt, or if he helps his friends ( read Ambani et al) to win an undeserved order. In return BJP will get party funding during elections from these very busom-friends. Ambani just filed for bankruptcy the other day, so where does he get funds for the BJP? Bulk of the offsets contract are for DRDO. Your take, Andy, is about right. Bharat (you) and Brahma Chellaney should be the NSA advisers……Our leaders live in a fool’s paradise. Bharat Karnad ji, would it be correct to say the Indian Air Force most certainly needs a long range strategic bomber like B1-B Lancer or Tu-160 so that it can carry out deep penetration strikes in China and other hostile territories. Bharat Karnad ji why has the IAF not shown any indication of this need? And have our DPSUs worked on any plan to create a indigenous one? IAF not interested (read the section in my last book — Why India is Not a Great Power (Yet) for details and analysis, and an indigenous strat bomber project not planned or even conceived. Bharat Karnad ji it seems Zoho a Indian company as developed the first Indigenous 4G LTE Modem, while this is not a chip set, do you think ventures such as these should be protected from foreign companies and promoted so as to grow further.